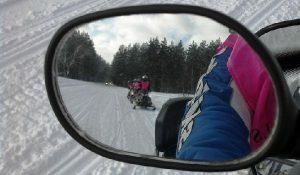 The 26th Annual Easter Seal For Women Only ride took place on a beautiful weekend. Lots of fresh snow, cold temperatures, a little sunshine and much camaraderie with old and new friends. The ride was attended by the following Snomad members: Marlene Kish, Mary Newman, Patty Paul and Liz Gunst Weisman. These riders each raised in excess of $1,000. The event raised nearly $40,000. This was a year of restructuring of the ride and promises of many new sponsors for next year. Renee Wyatt from many years ago was in attendance and helped with the entire weekend activities. Kevin Kelly from Easter Seals was new this year and was also a major part of setting everything in place for the weekend. Other Easter Seal staff was on hand to help. It takes a tremendous amount of work to see this weekend go off without a hitch. And this year was no exception. Friday night, all the riders needed to stand, give their name, number of years of participation and tell why they are supporting the event. It was a nice way to learn every ones name and get to know them better. The 27th year event will take place on February 7-9, 2014. It is not totally certain, but looks like it will take place at the Alpine Lodge once again. They were very accommodating, helpful and pleased to have us there again. There was a trail ride photo contest with the winning group receiving Target gift cards. The winners were from Patty Paul’s group. Many photos were submitted and showed much creativity and loads of fun. A male rider stopped at a group and volunteered to dress up as a Hawaiian snowman, also giving the group $50 for Easter Seals. Not much excitement in my group. We saw a black squirrel. The weekend never fails to bring friends together for a good time with lots and lots of fun. I received recognition for the most years of participation…..22 years. I encourage other Snomad women to give this ride a try. You can receive some assistance with raising the required $500. You may not be guaranteed snow every year, but you will have a wonderful time, make new friends all while supporting a terrific charity.